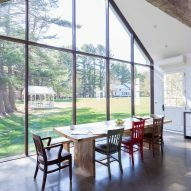 Designer Tom Givone has overhauled a farmhouse in rural New York, with the addition of a glass-fronted extension overlooking a creek. 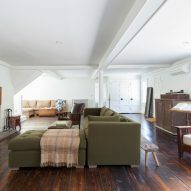 Self-taught designer Tom Givone transformed a dilapidated building in Eldred – a small town in upstate New York – to create a large, light-filled residence with generous kitchen, dining and lounge spaces. The extension also features a veranda that projects out across the surface of a neighbouring creek, hence the name Floating Farmhouse. The two-storey house was built in the 1820s and has original colonial revival touches, such as white-painted timber cladding, original wood floors and beams, double hung sash windows and a small arched attic window. Givone overhauled the interior, exposing original beams and hardwood floors, and adding a new wood-burning stove in the kitchen. The home is completed by polished concrete floors, a vaulted ceiling and large quantities of natural light, brought in through the new glazed wall. "Sited at the edge of a pristine creek, with a waterfall cascading over an ancient dam of hand-laid stone, the Floating Farmhouse was a sinking ship when first discovered," said Givone. "After a design and renovation process spanning four years, the 1820s manor home is now a study in contrasts: fully restored to its period grandeur while featuring purely modernist elements, including a curtain wall of skyscraper glass in the kitchen, and polished concrete and steel finishes," he said. The floor plan was reconfigured, allowing a large living room to takes up much of original ground-floor footprint. A double-height fireplace centres the space, with the kitchen addition on its other side. Also on the ground floor is a separate entrance, a utility room, a small bathroom and a bedroom. Two separate staircases lead upstairs, where these is a large master bedroom with a fireplace and a private bathroom, as well as a second bathroom and two bedrooms that face the street. Antique pieces feature in the bathrooms, such as an Italian marble hand-chiseled sink from the 18th century. Givone discovered this in a hillside on the outskirts of Rome. "I mean hillside literally; it was lying in the dirt on a grassy slope littered with other ancient stone artefacts," he said. A heavy steel angle bracket is hidden in the wall to hold the sink. 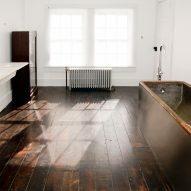 The wood and copper bathtub dates back to the late 1800s, and was salvaged from a tenement living in the Lower East Side of New York City. "I wrapped the tub in stainless steel to emphasise its clean architectural lines and recast it in a thoroughly modern context," said Givone. 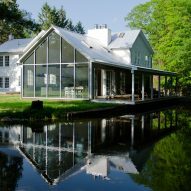 Floating Farmhouse bears some similarities to another renovation project that Givone has completed – a curvaceous extension to a traditional house in rural Pennsylvania. 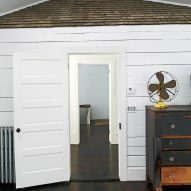 Both projects combines antique furniture pieces with white, light-filled spaces. 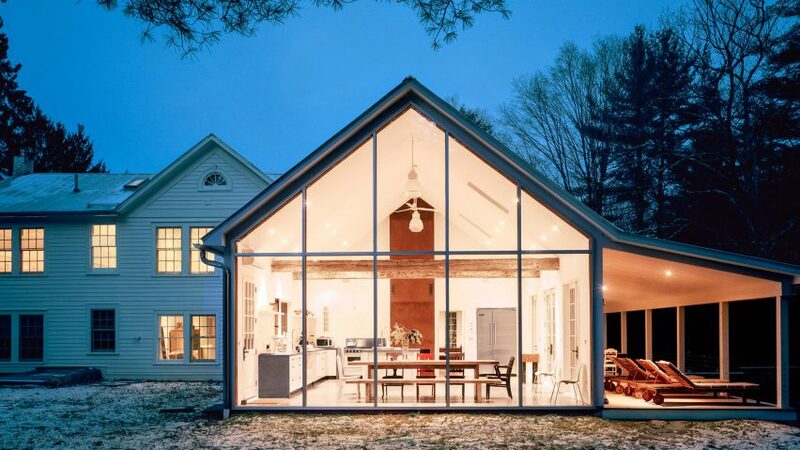 "The Floating Farmhouse is an experiment in how opposites attract," added the designer. "The hope at the outset was to combine archaic and modern elements throughout the home in a way that enhances the innate beauty of each by virtue of its contrast with the other." Photography is by Mark Mahaney unless stated otherwise.